In this series of blogs, we are reviewing the plethora of ad extensions on offer from Google and what they can do for your ads. 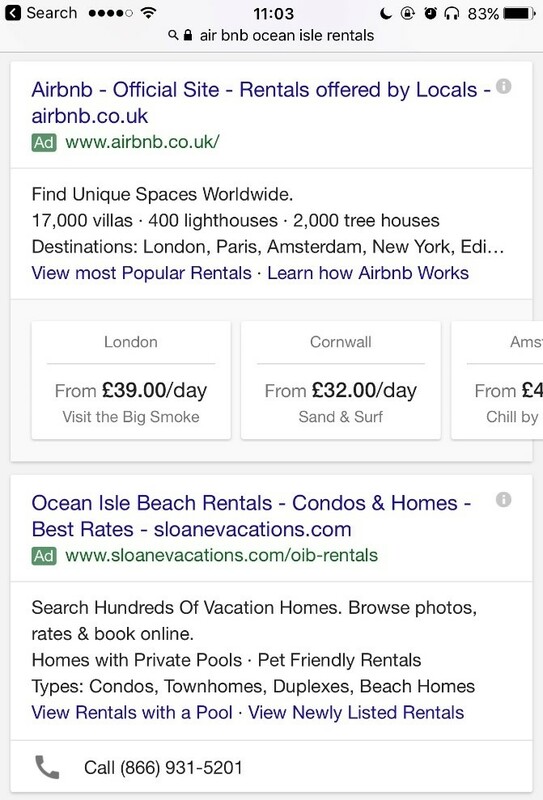 If you haven’t already, please see our first instalment where we reviewed sitelinks, callouts, structured snippets and call extensions, as well as why you should be using ad extensions wherever possible. Message extensions will show when viewing ads on mobiles and allow the user to, with one click, contact you via text. Working with a number of charities, we commonly use them for text donation asks, as you can prepopulate a text with, for example, DONATE3 to donate £3 per month. They can also be used to book appointments or classes or to receive quotes. They can be a great addition to your extension library, not only offering a one click call to action but also taking up more space on the already space limited mobile results page, giving your ads more prominence. One thing to take into consideration is that your business must have a phone number that is able to receive, send and process the text messages. If you have a physical location associated with your business or charity you can use location extensions to add another line below your ad with an address, map or distance away from the location, as well as either a phone number or click to call button. The clickable pin can take you straight to Google Maps if a map does not show on the results page, and if your Google My Business page is linked then opening times and reviews may also show. Interestingly, location extensions are also a way of getting your phone number to show if your call extension does not show. As is a theme with the fact that you can stack extensions, the more space you take up on the results page the more prominent your ad. Price extensions allow you to showcase the different types of products or services that you offer on both mobile and desktop searches. Shown below as it would appear on mobile, the extensions feature in a scrollable reel below the ad of up to 8 cards displaying products and associated prices. Price extensions can increase how impactful your ad is by showcasing what you have on offer compared to your competitors and taking up vital space on the results page, especially on mobile. You also allow the user to click through directly to the most relevant page on your site, making their journey easier and giving them a shortcut to converting. 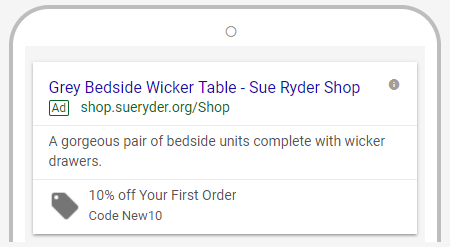 Promotion extensions, currently only available in the new AdWords interface, show below your ad and are a great way to display any monetary or percentage discounts that you are currently offering. You can enter a specific promotion URL, as well as select the extension as a special occasion, such as ‘Back to School’ or ‘Christmas’ to show as a bold label next to the offer. Additional options include adding qualifiers such as ‘on orders over’ and displaying promotional codes. Using promotion extensions where applicable gives potential customers another reason to click on your ads over the others, and may lead to higher click through and conversion rates. We still have a few more extensions to review so be sure to check in for the final part of this extended series!